Speak to the wrist, buddy. My face is not listening. 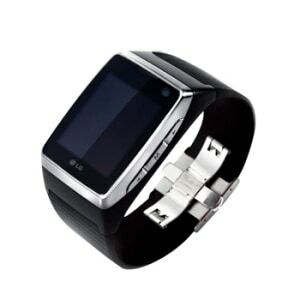 Yes, as the name Watch Phone so tantalisingly hints, this is a phone that sits on your wrist, much like a watch. Such have things have been produced before, but mainly by Chinese vendors of novelty tat. This is the real deal. This one has been lavishly hand-tooled by South Korean vendor Lucky Goldstar, a company that sounds like a Jewish cowboy but is actually a prestigious consumer electronics megacorp. The Watch Phone uses a slick touchscreen interface, has a camera for video calling – remember to elevate your wrist if you don’t want to look like you’ve got more chins than the Hong Kong phone directory – and it even has a media player built in. 1] Use your wrist constructively for once – there’s a nifty USB connecter for this, and you really can’t go wrong with the easy to manage touchscreen feature – you’re going to look so cool! 2] It’s got MP3 capabilities alongside the camera, bluetooth and video calling options. 3] Just in case you were worried, it does tells the time and you can see it clear as day, just like on your boring old watch. It’s surprisingly easy to type and text on too. 4] There’s 80MBs of internal memory packed into this little legend. For more information visit the product’s official website.